Editor's note: Small schools are seeing great success with Google for Education tools. We spoke with educators and administrators from smaller schools and districts across the United States to better understand how technology has helped them innovate, create more efficient processes and make a positive impact on their students. This is the first in a series of posts that explore the impact and successes of small schools. To learn more about using Google for Education tools in independent schools, visit us here. Teachers and staff at smaller schools are experts at stretching resources and keeping close tabs on expenses. For independent schools, it’s important that tuition remains affordable. Historically, bringing new technology solutions into classrooms has presented a tough choice for these schools: buy new devices and software and raise tuition, or maintain tuition while settling for out-of-date technology that doesn’t position students well for the future. Today, schools are discovering that technology can not only be affordable, it can also help teachers and staff save time and increase productivity. 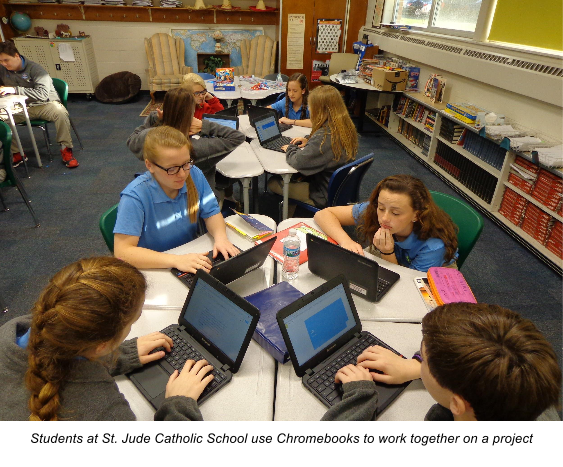 St. Jude Catholic School in Indianapolis maintained the balance between technology upgrades and affordable tuition by introducing Google Classroom and Chromebooks to their students and faculty. Google Apps for Education, a suite of productivity and collaboration tools that includes Google Classroom, is free for schools, and Chromebooks cost a fraction of what other tablets, desktops and laptops cost. “We’re a tuition-based school, so having the ability to expose our students to advanced technology, such as cloud computing, without drastically increasing tuition is a huge benefit,” says Joe Shelburn, principal at St. Jude Catholic School. At Lake Catholic High School in Mentor, Ohio, school leaders faced a similar situation: they wanted to buy laptops for every student, but were concerned their budget wouldn’t stretch. “We didn’t have enough state funding to cover the entire cost — the purchase had to come out of the school budget, and we didn’t want to raise tuition to do it,” says Taylor Smith, the school’s technology coordinator. Chromebooks quickly became the school’s top choice for its 1:1 program, since they didn’t break the budget starting at $149 per device. Chromebooks are also easy for the school to maintain. Quite simply, they don’t have many technical issues, and any issues that arise are easy to fix. They’re also light and sturdy, making them easy for students to carry. When the school switched from legacy software to Google Apps for Education, teachers no longer needed to spend hours on time-consuming tasks like printing and organizing paper assignments. “I’ve dramatically reduced the amount of time I spend in front of the paper copier this year,” says Hunter Upchurch, a Spanish instructor at Jackson Prep, noting that worksheets and quizzes can now be shared through Classroom. The saved time not only gets put back into student programs like sports and music, it helps teachers reduce their “homework”— so they have more time to spend with friends and family when they go home for the day. When teachers and staff are able to shift away from the slower, paper-based processes that once ate up their time, they make room in their busy schedules to work on projects that would normally be pushed to the backburner, or on creating spectacular lessons for their students. Modern, easy to use technology like Google Apps for Education and Chromebooks can also help IT staff save time on things like computer maintenance and training, so they can focus instead on solving more strategic, challenging problems. Switching from desktops and legacy software to Chromebooks and Google Apps for Education has allowed Joe Schultz, tech support specialist at Carmel Catholic High School in Mundelein, Illinois, to reduce the amount of time spent fixing PCs, maintaining their old Microsoft server and troubleshooting tech issues. “I’m less busy solving technology-related problems than I was a few years ago,” Schultz says. He plans to devote the saved time to projects like improving network efficiency. Shop around: There are many devices on the market, so find the ones that meet your students’ unique needs. For example, tablets can work well for younger students who can’t yet type on a keyboard, while laptops may be suitable for older students who spend a lot of time on research. Look to the cloud: Reduce IT maintenance, training time and overall costs with easy to use and easy to manage cloud-based solutions. Is your school saving time and money by getting creative with technology? We’d love to hear your tips. Share your story below or on Twitter and tag us (@GoogleEdu) or include the #GoogleEdu hashtag.